It’s back and it’s bigger than ever! Now in its 5th year, Merry Folking Christmas continues to offer excellent live music, art and theatre and for only £10! 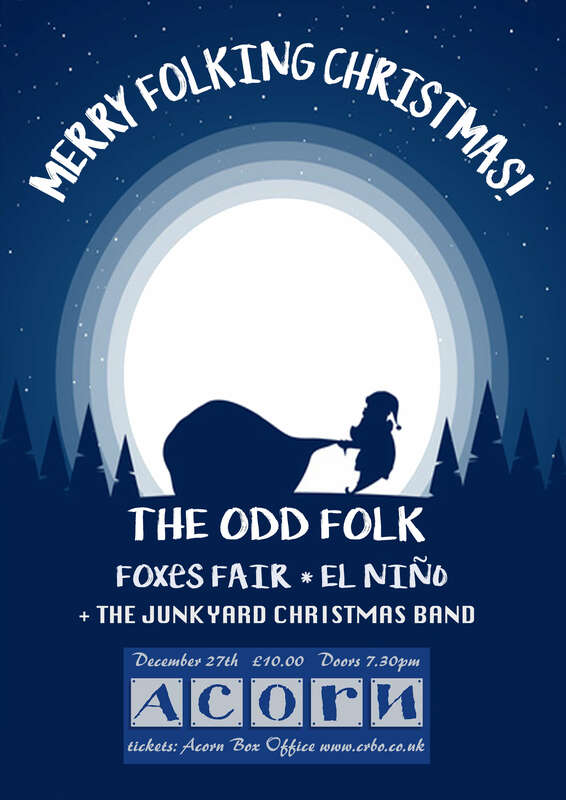 THE ODD FOLK once again host their Christmas party, supported by the gorgeous festive harmonies of the FOXES FAIR. Later on it’s over to the JUNKYARD CHRISTMAS BAND; a homemade handpicked creme de la creme of local talent playing all your favourite carols with a BIG twist! If that’s not enough, downstairs will be turned into a tropical Christmas carnival by EL NINO, with a special guest appearance from KING LOUIS himself. As always The Acorn will be transformed into a winter wonderland by local artists as they create their very own Narnia. So get dressed up and let’s get Merry!